Isaiah 40-55 is known as ‘The Book of Comfort’. God will comfort and look after his people. In ancient cultures a relationship and bond of commitment was sealed by a meal together. They also acknowledged with a prayer of thanksgiving that something was sacrificed (an animal, a grain of wheat..) in order that human beings were fed. A ‘sacrifice’ enabled a ‘meal’ which established a ‘bond between the participants of a meal’. This is the basis of a ‘covenant’ meal in the Old Testament, the Last Supper and indeed the Eucharist Christians celebrate. God promises to feed us without money being paid. And to nourish us both physically and spiritually. Consider the gifts God gives you each day. How has God been ‘feeding’ you? St Paul himself endured being beaten, stoned, whipped, shipwrecked, imprisoned. Yet he boldly declares nothing can separate us from God’s love revealed in Christ. What current experience causes you to think and feel ‘separated’ from Christ? Does Christ on the Cross ‘bridge this gap’? Matthew 13 was filled with Parables on the Kingdom of Heaven, Matthew 14 is now concerned with the Kingdom of the Church and the mission of the Disciples. We are taught how we are to be and live. John the Baptist, the greatest prophet, has been killed. This sadness causes Jesus to retreat to a deserted and lonely place. Consider all the feelings of Jesus in loosing a very close companion. Wanting silence and rest. Having a crowd chase after him. Tired and yet moved with pity and willing to give of himself. What do you learn about Jesus? About God? About yourself? John the Baptist spoke courageously reminding Herod he cannot marry his brothers wife. Why does the world seek to remove the ‘voice’ of a prophet? Have you experienced the tension and risk in being a ‘prophet’ today? What happened? Matthew is seeking to show Jesus as the fulfilment of Moses and all the prophets. Parallel to the feeding in the desert (Moses / Exodus) Jesus now feeds a large crowd in a ‘deserted place’ with bread. There is an abundance of food (a symbol of the great messianic age). Each Apostle is left holding one of 12 baskets of bread symbolic of the new Tribe of Israel (Church). The Disciples now have the job of feeding the hungry. Imaginatively enter the scene and pretend to be a disciple. What did you learn? The Disciples had a ‘poverty mentality’. Jesus had an ‘abundance mentality’ when even a small amount of resources were offered to God. Consider your response to the ‘poor and hungry’ this week. What could you do with the little you have? What is one action that you will do to be ‘livingheword’ this week? 17th Sunday Yr A – are you possessed? Solomon is not simply having a ‘dream’. The last person to possibly take his kingship (Shimei see 1Kings 2, 8) has now died so Solomon is now truly King. He has also just married the King of Egypt (Pharoah’s) daughter! Solomon’s power and political responsibilities are immense. He makes a special journey to Gibeon, a very special ‘high place’ and altar. With him he presents 1000 burnt offerings on the altar! (1Kings 3,4). The intensity of his prayer and yet his humility is striking. You have made me. I am your servant. I have the responsibilities of a King. Yet I am young. I don’t know what to do. Give me an ‘understanding heart’. What would your deepest and most heart- felt prayer be to God as God asks you: ‘Ask something of me’?. The journey of life involves ‘ups and downs’. It takes great faith to trust that ‘all things work for good for those who love God’. Consider a difficult life experience. How has it ‘worked for your good’? Have you allowed it to mould you closer ‘to the image of his Son’? The phrase ‘kingdom of heaven’ is the idea Jesus most talked about in the gospels. Having a heart for the poor. A desire and commitment to see that all are ‘included’. Fighting all systems that exclude and oppress. The compassion and forgiveness offered to us by God. These can be ‘ideas’ or ‘lived realities’. A treasure ‘thought about’ or a ‘treasure possessed’. Being possessed by ‘The Kingdom’ comes at a cost because it invites us into a complete transformation of our life. Compare your lifestyle with Jesus in the Gospels. What attracts you? What do you need to ‘let go’? What risk are you being invited to take? 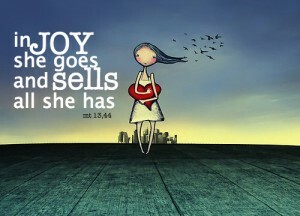 Filled with joy, the person in the parable sells all that he owns to buy it. The treasure (the kingdom) has now possessed him! Have you ever had an experience where something you valued is now considered ‘worthless’. How did your heart change ‘attachment’? What do you truly ‘love’ and would be willing to ‘sell all that you have’ for its possession? Are the top ‘values’ that steer your life Kingdom values or Worldly values? As in previous Ch 13 parables, Jesus includes a subversive challenge. There will be a judgment at the end of time based on how we have lived. Have we chosen and lived for the Kingdom and lived ‘rightly’ (righteously)? Or have we been ‘wicked’, consciously or unconsciously not contributing to justice and God’s plan for all? If the final judgement was to take place within a few months what would this cause you to do?